Q: “Hi Tom, I have a question for you! I'm working on controlling the effects of squirt and throw. I was watching some pros shoot online and it appears as though most of them simply pivot the cue on their bridge hand to apply right english. It seems to me that would entail a new aim line. 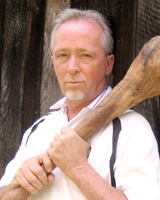 I have always moved the cue tip to the right and maintained the same aim line. Am I misunderstanding or have I just done it wrong for 55 years?" A: If you use sidespin, understanding squirt and swerve is essential to playing well. The only time the cueball goes directly where your stick is pointed is when you hit the Vertical Axis on the back of the ball. If you hit even a millimeter either side of the vertical center, your cueball will squirt, and it may swerve. And of course, when a spinning cueball hits another ball, there will also be "throw" effects. There are many stick lines that will pocket a given ball, as each increment of english or speed or elevation changes the correct aim. Any time you use english, an aiming adjustment is required. I'll assume you have the basic concept of squirt. It's caused by your shaft, and increases with tip offset (english). Left english causes the cueball to squirt to the right, so you have to aim a bit more to the left. Squirt is an angle change for the CB at the moment of impact with the tip. 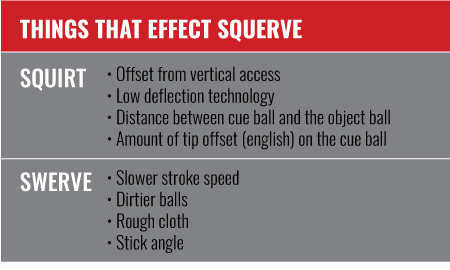 The farther the ball has to travel before striking its target, the more the cueball will diverge from the stick line and the more accurate your aim adjustment must be. Swerve is caused by stick elevation, combined with tip offset (english). 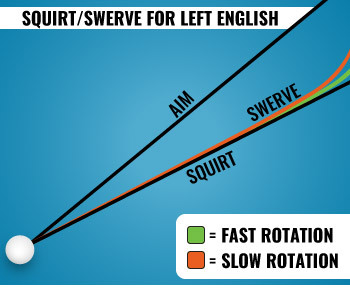 Left english can cause swerve to the left, opposite the squirt. You get more swerve with more elevation, more with more tip offset, more with dirty balls, and more with lower ball speed. Sometimes, squirt & swerve perfectly cancel each other out. Since squirt is caused by your shaft, and some shafts squirt less than others, you must become familiar with the squirt characteristics of your shaft. 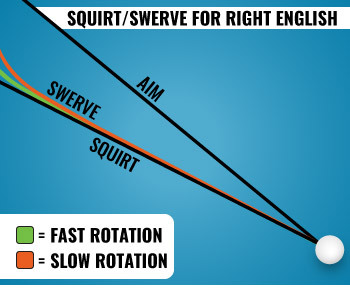 How can you adjust your aim to accommodate squirt? If you want to hit with left spin, the CB is going to squirt to the right. You must aim a bit farther to the left. Your new aim is going to look a bit funny, as it is no longer pointing straight at your ghostball target. We have a relative squirt measure called the Aim & Pivot Point (APP). The APP is a point on your shaft where, if you bridge at that point, you can aim your shot using standard ghostball aim, and then pivot your tip in the bridge to whatever english you desire, and stroke down that new stick line. This works because the squirt angle for that amount of english is the same as the angle you've pivoted the stick, when pivoting at the APP in your bridge. Frank Says: "A great way to reduce squirt is to use a performance shaft! We have dozens of fantastic low-deflection shafts to choose from, so check out our entire selection!" With a traditional shaft, that bridge pivot point often was found to be about 12" to 15" inches from the tip. That would mean you could bridge at that length, aim your shot as normal through the Vertical Axis of the CB, and then pivot your tip to whatever english you want, and the shot should work. However, with today's low-deflection shafts, the pivot points are often much farther from the tip, making bridging at that part of the shaft impractical. On the other hand, low-deflection shafts cause less squirt, and so don't require nearly as much aim adjustment. Shifting your stick in parallel to the no-english aim line is not exactly correct, but it can make a lot of shots. I'm betting that if you are a good player, you are also unconsciously changing the angle of the stick, while believing you are only moving the tip over. The reality of ball pocketing gradually forces us to see that the aim will work. Eventually, the correct stick lines for aiming with english look correct to you, regardless of what you assume you are doing.